I have the top (5/4 Red Oak) glued up on a 72” square, and I’m about to start getting the legs made. I wanted to run it by the folks here first, just to see if there was any input on the plan. 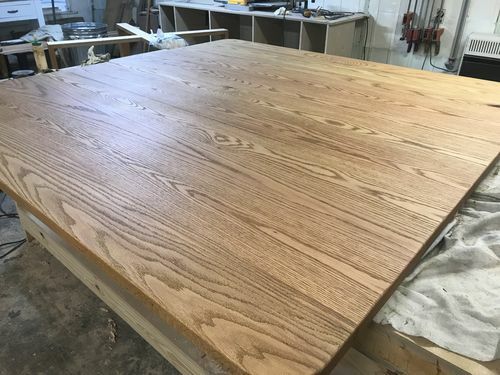 I’ve built a 14’ conference table (8/4 White Oak) with legs like this, and though they’re on face it was extremely sturdy. I mitered the joints, had 8 dowels (2 rows of 4 with the Dowelmax), and post-glue up I routed a slot with a jig and double splined each joint. I also added corner blocks on the top joints that weren’t visible. Insanely sturdy, wouldn’t budge at all. Still, I’m concerned about the aesthetics of the proportions on this table. 72” is large, and 5/4 material less so. My stock is 6/4 so I can keep the legs a little thicker and it won’t be noticeable once it’s surrounded by chairs. The sketch up above shows the legs at 1 1/4” still. 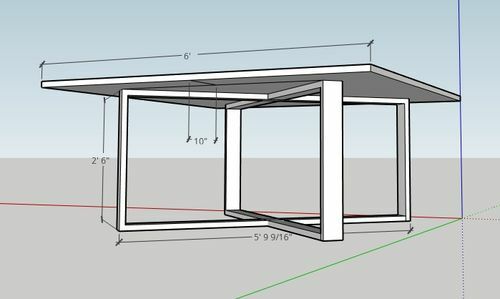 I have it currently designed so that you have 10” from the legs to the edges of the table (not the corners), and the full diagonal length is just shy of 6’. Pictures online of commercially made tables in this design have a great distance from legs to edge but I’m hesitant to go beyond 10” – 12”. Of course, once I get the base made I can also add to or change the design, but does anyone here see any glaring red flags, or ideas to enhance the form/function? IMO the whole base is a red flag. A traditional apron and leg base would be stronger and look better. I have to agree with Rick. I see structural problems with this design. Is this for yourself or are you thinking of selling it? As far as structural issues, this is essentially a 4 post base where you’re using the laterals to tie them in together. My worry would be that those squares will want to become parallelograms if any sideways pressure is applied, such as pushing the table in one direction. 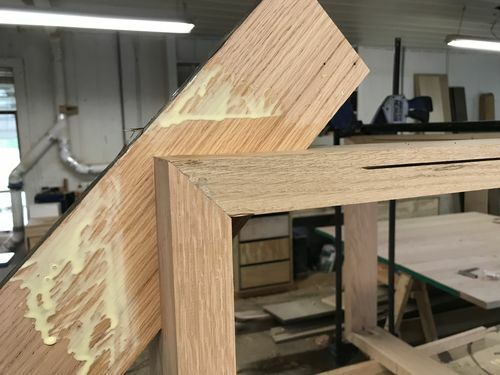 The joinery may be sufficient – it’s really hard to tell. 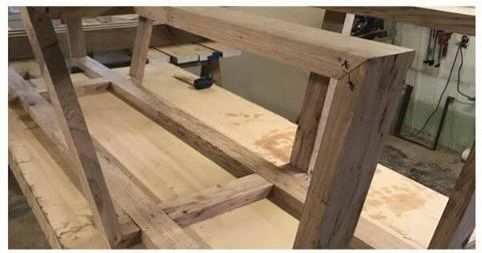 Those mitered joints will be tested for sure – but you’ve done something similar with the conference table so you know how it’s going to hold up. Aesthetically, my only concern is to get a vacuum cleaner under that, those laterals on the ground are going to get beat up over time. I agree with the concerns raised. Tables like this do exist commercially, but of course that doesn’t mean all that much. I don’t like the idea of 45 degree supports on the joints, but what I think I’ll try out is some oversized splines. 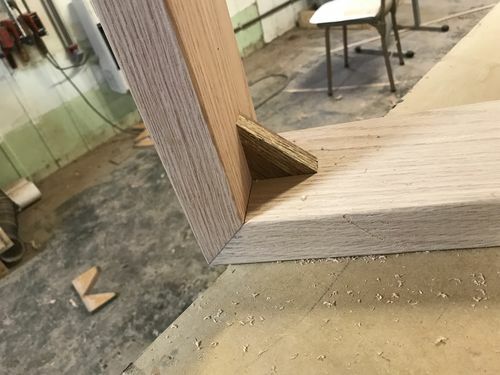 3/4” thick, and extending 4”-6” from the outside corner. You’ll see it through the inside, and see the endgrain on the outside of the leg. I can also peg it by drilling through the edge of the legs on the drill press. Alongside the dowels that would be a great amount of edge grain gluing surface, and the large triangular spline would resist a ton of racking. I don’t know how to put numbers on such a statement, but I’ll find out before it reaches the client that’s for sure. As mentioned above, I think you will have some major structural issues. The racking forces on your design will be significant. 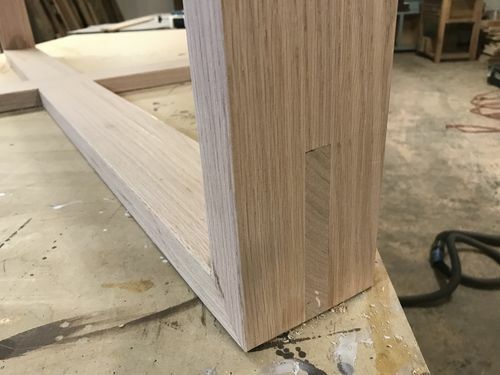 The miters will have little structural value and the addition of dowels will add little because the miter cut will leave only a small amount of “meat” to glue into. Your spline idea is a good approach, but IMO, to be most effective, the splines should be large with about 1/2 it’s width exposed on the inside of the corner. Another approach would be to add a radius (maybe 6”-8” radius) fillet block in the inside corner of each joint. Again, IMO, this would add the need stiffness and would have a pleasing appearance. The large rectangles would then have rounded inside corners. I think that if you feel strongly (or your client does) about having slender leg components of this design, you should have them made from rectangular steel tubing with welded corners. One other point not yet mentioned: with flat lower components resting flat on the floor, you risk having the table rock if the floor is uneven. You will need some short “feet” at each bottom corner (or inboard a bit) to prevent this. 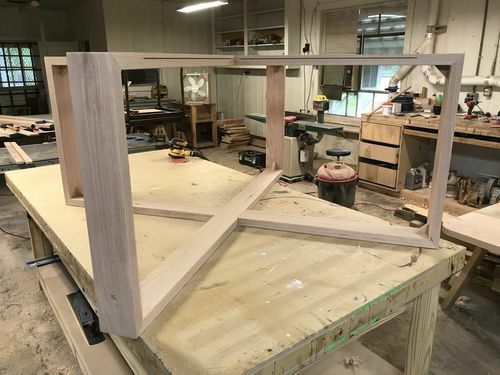 I don’t like the look, but I have no problem with the base, “if you want it you can build it”, even if that means drilling for welded steel 90* inserts in the corners. My problem is with the table top in that picture, unless thats a veneered top over particle board or some such material. You can’t band a solid wood top with solid wood, when the humidifier or dehumidifier (ha, ha) breaks down all your mitered corners are going to open up. I have seen those as welded steel, but not wood, and with a much thicker cross section. Personally with those legs, I would expect some “wobble” with that top. That could be fixed with a brace or apron, or much thicker stock. I would have no issue doing steel though. The top is just a panel glue up. No border. Thanks for the input everyone. Today I cut and milled my stock and laid things out to get a feel for it. I increased cross sectional dimensions from 4” x 1 1/4” to 4 1/2” x 1 1/2”. Proportion-wise it looks appropriate for the top and not at all wimpy. For racking, I plan on trying out my spline idea. I’ll glue up the doweled miters and then cut a slot in the center of the joint. I’m going to cut the slot 4” long from each corner, so I’ll have a spline that, once trimmed, is a 4×4 right angled triangle. It’ll be exposed on the inside of the joint, performing similarly as if I cut blocks and glued them in. I can’t find any pictures at all of what’s in my mind, but I’ll share findings here. If I’m not happy with rigidity it won’t be leaving my shop. I think it’s fine if you bump it up to 1.5”. I think an apron would look awful. With minimalist designs, people will have to deal with a little wobble. It’s just the way it is. If every table were built for strength, they would all look the same. Glad to hear that you are making a test joint. While you are at it, why not make one with the spline but without the dowels? I don’t think the dowels through a miter will offer much, if any, additional strength. 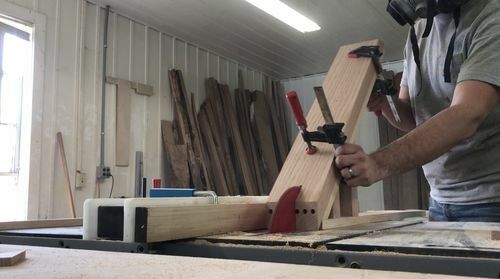 I like dowling my miters because it makes the glue up so incredibly easy. Plus, it must do something.. I made a jig to cut slots in the ends of each miter joint for the oversized dowels. Dado stack couldn’t raise high enough, so had to stack two 10” saw blades with a couple shins between. Each slot took 4 passes (made spacers so didn’t need to adjust fence) and comes out to 3/4” wide. It cuts into the center two dowel holes I already had drilled, so obviously I just didn’t use those. Second pic shows the slots lining up during the glue up. 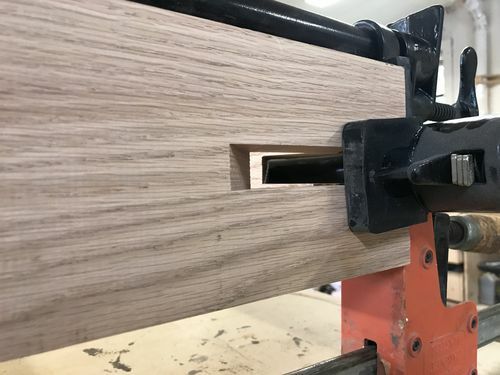 The through-spline will have a reveal on the inside of the joint of about 2” out from the corner. I think it’s going to look pretty cool. I look forward to seeing it all glued up. I think it will be very strong. Some kind of with/without strength test would be neat if you have the means and materials. With boards that wide, I wonder how a double spline might look. I considered a double spline but decided against it. I think it would suit a different table, but this one I wanted as minimalist as possible. Here are the pics. It’s absurdly strong. No movement no matter what I did, including sitting directly on the center. Finished with Rubio Monocoat ‘Oak, to be delivered on Monday. I’ll make a project post for it. Minimalism can be an acquired taste, but you sure can’t fault your construction, looks great.